If the identity of a sitter for a portrait is lost, how can it be found? Art has always used symbols to give us clues as well as add embellishment. 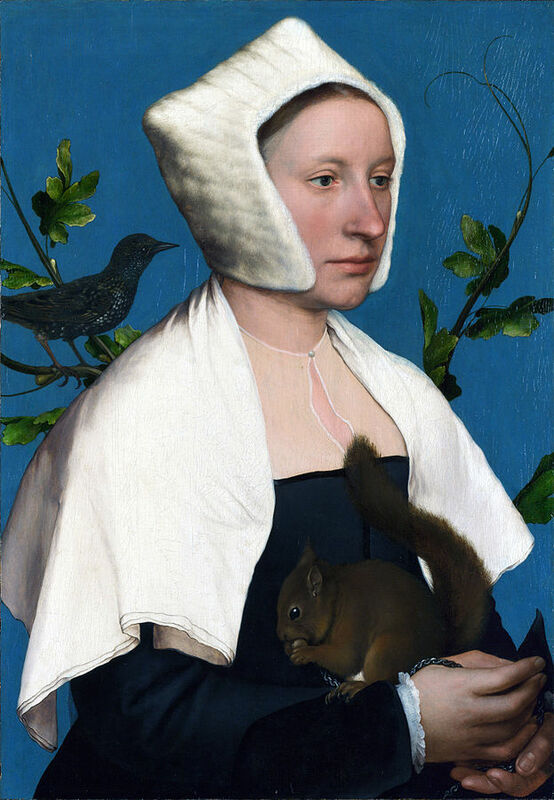 The lady here is posed with a squirrel, an animal featured on the Lovell family coat of arms. They were popular pets in the 16th century, but they also represent obedience and restraint (admirable traits in a woman), further emphasised by the fact that squirrel is on a chain. On a branch behind the sitter is a starling, perhaps a reference to the East Harling home in Norfolk owned by Francis Lovell, whose uncle served as Chancellor of the Exchequer and Secretary to the Treasury for King Henry VII. In keeping with tradition, this could have been half of a husband and wife portrait. Hans Holbein the Younger is the artist of this work, and it was painted when he first visited England in 1526. At the court of Henry VIII he was commissioned to paint the likenesses of everyone from the King himself to noble families, and was even sent to paint portraits of potential new wives for the king – Anne of Cleves most famously. Holbein brought a whole new sensibility to art in Britain, a country that was a bit behind Europe in experiencing a cultural Renaissance. It is likely that he visited Italy, certainly the influence of masters like da Vinci and Titian can be seen in the clean compositions and jewel colours that are characteristic of Holbein. But these elements are blended with a strong northern sensibility for naturalism and perception. Northern Renaissance art is associated with scientific study of the world and a love of capturing it in minute detail. Holbein was a master of portraiture – not only because of his astounding technical skill, but more importantly his ability to create insightful and enigmatic paintings.